Today will be remembered as the day that the new conservative media began its descent. Instead of reporting the news, the new media has become an arm of the Mitt Romney campaign in the 2012 presidential race, even the liberals at the Politico are noticing it. From internet websites like the Drudge Report to talk radio hosts like Rush Limbaugh and Glenn Beck to the columnists like Ann Coulter and Charles Krauthammer, almost the entire conservative media has taken it upon itself to promote the much unloved liberal republican Mitt Romney. As I reported before, Mitt Romney’s company bought out Clear Channel, which syndicates all of the conservative talk radio shows; this has resulted in an overwhelming bias for his candidacy among talk radio hosts. I also wrote about Ann Coulter lying about Mitt Romney’s conservativism and Glenn Beck calling the TEA Party racist. 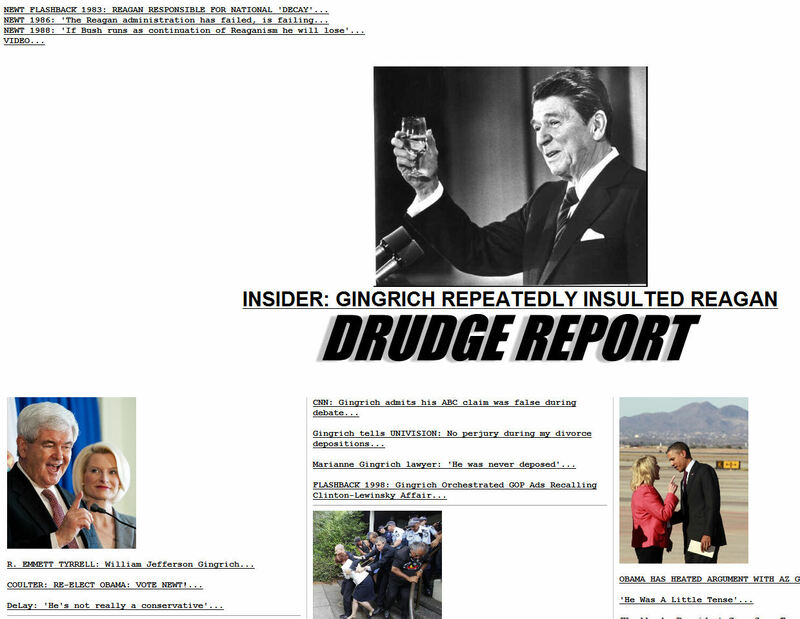 The Drudge Report has been posting anti-Newt links for most of the campaign, but today they reached a new low. 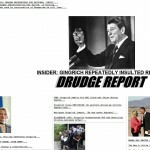 Click on the thumbnail above and you will see a full-sized image of the Drudge Report page from today. As you can see, the top and two left-most columns are filled with links to anti-Newt stories (12 links and 2 images). The is what has become of the conservative alternative to the old media; let’s face it, the new media is now dead. We can now no longer believe anything that we get from the new media. They have become a pack of liars, slanderers, and propagandists for the cause of a liberal republican. They have become the republican establishment that they warned us about. Conservatives, these were your friends. Let’s be clear that the candidate that they are backing, Mitt Romney, is the most liberal of all of the republican candidates in this election cycle. They have chosen to back him, despite the fact that he is disliked greatly among conservatives. They have tried to lie to us and tell us that Mitt Romney is the real conservative and the only republican who can get elected. Those of us who are TEA Party conservatives have consistently chosen Newt Gingrich as our candidate. Today, I am through listening to the lies of the so-called conservative new media. I am through being insulted by the so-called conservative new media. I am through hearing propaganda against a genuinely conservative candidate. Today, I will find more honest sources of information.